Purpose: To construct several galvanic cells and to compare their measured cell potentials, Ecells, to those predicted from a table of standard reduction potentials. 1. As described in step 2 below, construct at least six different galvanic cells using the provided metals and solutions. Test the cell potential of each galvanic cell as described in step 3 below. 2. 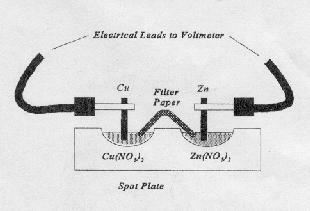 The diagram below shows the setup for a galvanic cell constructed using the metals Cu and Zn. Use the diagram as a guide to construct the six cells which are required for this experiment. The small strip of filter paper which will act as your cell's salt bridge should be soaked in a solution of KNO3. The strips of metal used should first be polished with steel wool to ensure that they do not have a protective oxide coating. 3. Use a voltmeter to measure the cell potential of your galvanic cell. Connect the meter so the voltage reading is positive. Use the most sensitive scale which is practical. 4. Dilute the 1.0 M Cu(NO3)2 so it is 0.0010 M. Count l8 drops of distilled water into a small test tube, and add 2 drops of the 1.0 M Cu(NO3)2 solution. Mix well by pouring back and forth from one test tube to another. This solution is now 0.10M. Repeat this dilution process two more times, preparing a solution which is 0.0010 M. Pour some of this 0.0010 M Cu(NO3)2 solution into one of the wells in the spot plate. Add a piece of polished copper wire and measure the voltage against the zinc solution and zinc metal. 1. For each of the galvanic cells you constructed in steps 1-3 of the procedure, calculate the cell potential using the table of standard reduction potentials in your book. Compare your calculated values to the values you measured. 2. Using the Nernst Equation, E = E - 0.0592/n (logQ), calculate the cell potential for the galvanic cell that you constructed in step 4 of the procedure. Compare your predicted and measured values. Add the following to your normal discussion: Pick any of the galvanic cells which you constructed, and draw a diagram of the cell showing the following information: 1) Which ions were being produced and which were being used, 2) the direction the ions in the salt bridge were moving, 3) the direction that the electrons were moving, and 4) the anode and cathode of the cell.